According to a message posted on Sharon Jones and the Dap-Kings' Facebook page as well as on the band's official website, singer Sharon Jones passed away Friday, Nov. 18, 2016, following a long battle with pancreatic cancer, "surrounded by her loved ones, including the Dap-Kings." She was 60 years old. A longtime staple in The Current's playlist, Jones and the Dap-Kings first performed in The Current's studio in 2005. In 2010, Sharon Jones and the Dap-Kings performed at Rock the Garden. Jones was born in South Carolina, but lived most of her life in New York, where she first got into singing as a gospel singer at church. Her professional career began in 1996, when she was hired as a session backing vocalist for Lee Fields. In the early 2000s, the newly formed Daptone Records embraced Jones as a lead singer, subsequently building a band around her. The label released Sharon Jones and the Dap-Kings debut album, Dap Dippin' with Sharon Jones and the Dap-Kings, in 2002. Prior to her full-time music career, Jones had worked as a corrections officer at the prison on Rikers Island in New York, and as an armored car guard for Wells Fargo Bank. 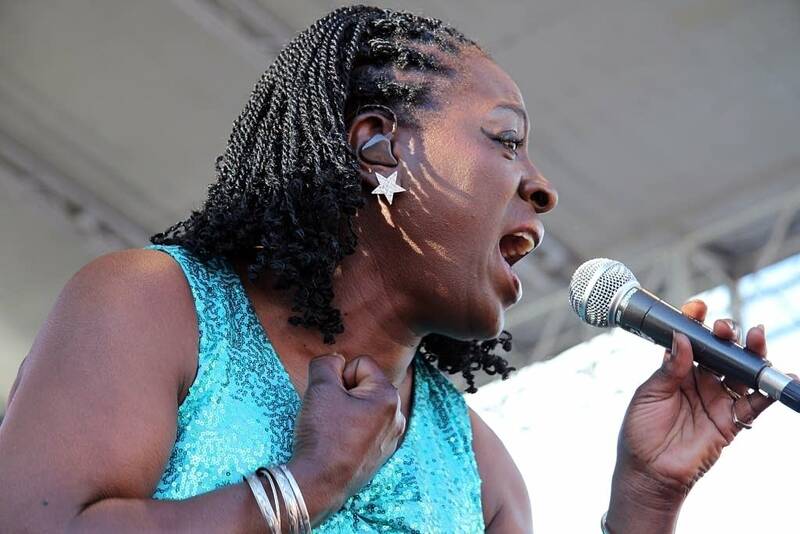 Known for her powerful voice, her soulful songs and her indomitable spirit, Jones was recently featured in the documentary, Miss Sharon Jones!, which detailed her music career and her battle with cancer, first diagnosed in 2013. In 2014, Sharon Jones and the Dap-Kings' Give The People What They Want earned a Grammy nomination for Best R&B album. Jones's most recent studio album was the 2015 holiday release, It's a Holiday Soul Party. Sharon Jones Tells Cancer 'Get up and Get Out' The Dap-Kings' unstoppable lead singer looks back at her cancer battle, which was chronicled in the documentary 'Miss Sharon Jones,' and draws strength from soul songs. Album of the Week: Sharon Jones & the Dap-Kings, 'It's a Holiday Soul Party' With new tunes and new takes on the classics, Sharon Jones & the Dap-Kings' new seasonal collection brings a little funk, soul and joy to the holidays. Sharon Jones & The Dap-Kings Play One For Hanukkah While the Festival Of Lights is still in full swing, watch Jones perform "8 Days (Of Hanukkah)" as part of a special, holiday-themed Tiny Desk show. Album Review: Sharon Jones and the Dap-Kings, 'Give the People What They Want' Sharon Jones and the Dap-Kings are giving the people what they want: a new record full of the attitude and tenacity you'd expect from the soul singer combined with the crisp horn arrangements from the Dap-Kings. Rock the Garden 2010 A recap from Rock the Garden 2010 featuring audio and more! Sharon Jones and the Dap-Kings perform in the Current studios New York's Sharon Jones and the Dap-Kings have been kicking out impeccable, James Brown-esque throwback funk and soul for nearly a decade. Sharon Jones and the Dap Kings perform in studio Having been born in Augusta, Georgia, the same town as the legendary James Brown, it should be no suprise that she's known to many as the "Queen of Funk." Sharon Jones brought the Daptones Record house band, the Dap Kings, into the Current studios to perform two songs.